Doha, Qatar – December 10, 2018 – At a time when some people seem to struggle to disagree agreeably, students at Northwestern University in Qatar (NU-Q) are learning how to debate opposing viewpoints collegially through the university’s Debate Club – and they are winning awards and recognition. The Debate Club is led by Ayman Al-Rachid and Sikandar Ali Chaudary, who serve as co-presidents with NU-Q Professor Torsten Menge as the faculty advisor. Since the club re-launched in 2017, the students have been participating in several tournaments and earning awards in recognition for their speaking abilities. “Being able to converse calmly but confidently with someone who does not share the same perspective is a valuable and necessary skill to develop in life, and this club – one of many at NU-Q – trains students in that life skill,” said Everette E. Dennis, dean and CEO of NU-Q. Most recently, NU-Q’s team members Lina Draidia and Natasha Das placed within the top 10 speakers during the first English Qatar Universities Debate League (QUDL) tournament, and the team overall made the top 10. At the second English QUDL tournament last month, NU-Q debaters Mohamed Eltayeb and Ali Chaudary defeated the Qatar National team coming in third, behind Qatar University and Weill Cornell Medicine - Qatar. 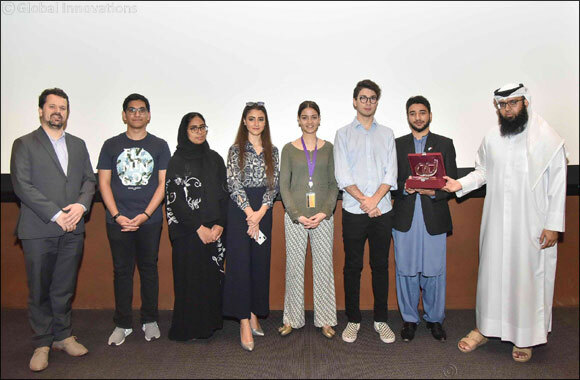 The members of the club participate in monthly tournaments and additional events, and last year, hosted a QUDL tournament – a first in NU-Q’s Debate Club history. NU-Q now has hosted three debating tournaments so far with plans to continue. The club members meet weekly to prepare – splitting into two teams to train and compete in both English and Arabic debates. Al-Rachid believes that in order to be a leader, you have to have the ability to bring your ideas together into a logical argument while also respecting other views presented and considering the other side of a story. “I wish people knew that public speaking really helps us solve many of society’s problems. Our societies lack communication skills and the ability to share ideas freely, which is stopping us from moving forward and accepting each other’s views. Debating makes us creative and stretches our limits by trying to be in other people’s shoes for once. Taking part in both sides of an argument is a healthy habit, and it brings us together no matter how different we are,” he said. The Debate Club at NU-Q is one of several student-run organizations at the University from The Daily Q, its online newspaper to Studio 20Q, which provides opportunities for students to experience filmmaking outside of class.